On Saturday, April 8, William Jewell College had its annual Jewell Day of Service on which students devote their Saturday morning to serving the community. Jeff Buscher, College Chaplain, explained that while the fall Serve and Celebrate day was around before he started at Jewell, the spring Jewell Day of Service began around 2010. However, because of the timing of Jewell’s winter break, students may or may not be on campus for Martin Luther King Jr. Day. Although spring Jewell Day of Service and fall Serve and Celebrate both focus on serving the community around Jewell, Buscher comments that he likes to switch up the volunteer groups during the two separate days of service. Buscher has local agencies he contacts each year to let them know the date and asks them if Jewell students could volunteer at their organizations. This year, Jewell students volunteered at 15 organizations, including Jewish Vocational Services, Hope House, Rebuilding Together Kansas City and Earnest Shepherd Youth Center. 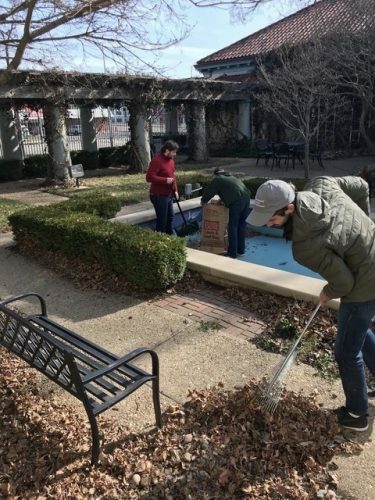 Even though the Saturday morning for this year’s day of service was bitterly cold, Jewell students woke up early to serve their community. Buscher also notes that the Jewell Day of Service is an educational experience where students can learn more about the organizations in our community. Hannah Jacobs, a first-year biology major and assistant to the chaplain, volunteered on Jewell Day of Service and went to Hillcrest Hope Avondale apartments to help clean and organize the community living space. For Buscher, seeing students show up for Jewell Day of Service is a huge encouragement. Hearing the positive responses from the organizations makes the whole event worth it. Photos courtesy of Jeff Buscher.